Most of the time, I take pictures of people. Originally, when I first bought my camera, I was excited to snap pictures of wildlife, but soon learned that I lacked the patience for great wildlife photography. I also hated zoom lenses. In Sri Lanka, I decided to change things up a bit, and point the lens towards the hilarious and curious animals that were almost everywhere we looked. I still (unjustifiably) dislike zoom lenses, so all of these shots are from my 35mm lens. Nap time for a monkey by the side of the road near Delhouse. I love elephants, and getting this close to one is just too good. This monkey in Yala National Park tried to take a backpack and also wanted a ride in our jeep. This little guy might just be the next big wildlife photographer. Chances are, at least one wall would have a whole family of these geckos each night. We were lucky enough to see green turtles come ashore and lay their eggs, just as they've been doing on the same shore for thousands of years. These turtles are huge! The turtles will lay their eggs, often 6 or 7 at a time, and then bury them and swim back into the water. Like I said before, this guy was pretty interested in getting a ride with us. 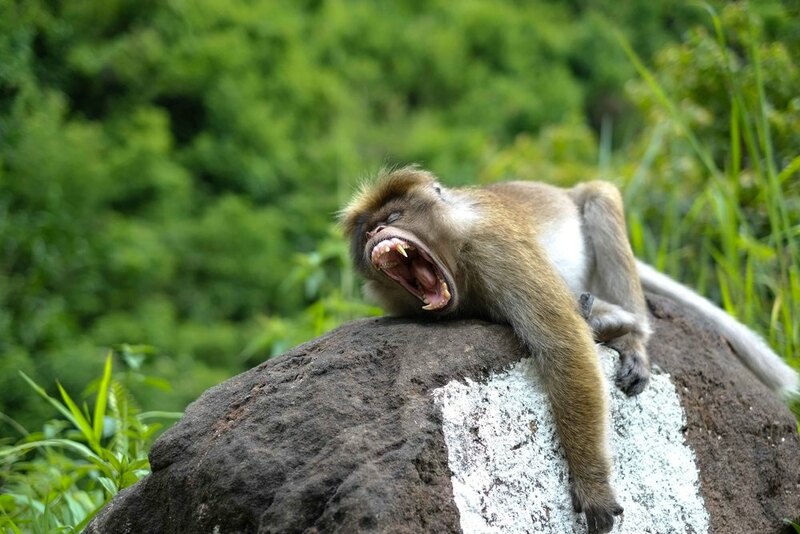 Monkeys: arguably the most hilarious of all animals in Sri Lanka.